A wide range of ocular emergencies, conditions, and manifestations of systemic illness are regularly encountered in the emergency department (ED). The recognition of these conditions and comfort in diagnosing and treating them are important to both the patient and the physician. 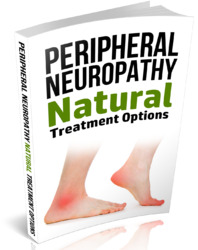 As with any other part of the body, proper and early intervention can significantly enhance recovery and outcome. 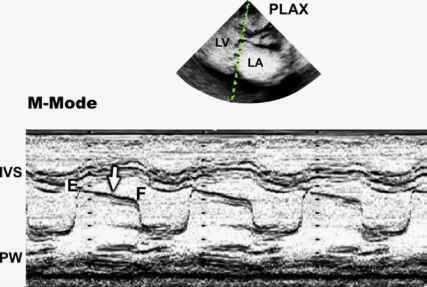 The ED physician should be comfortable with the use of a slit lamp, Tonopen and/or Schi0tz tonometer, and direct ophthalmoscope and be familiar with ocular anatomy (Fig 230:1, Fig 23.0-2.) and neuro-ophthalmology. The approach to the patient should proceed in typical fashion with a good history and physical examination, with treatment of life-threatening conditions taking priority. FIG. 230-1. 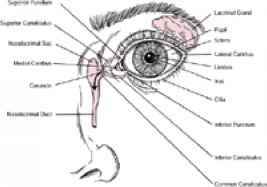 Anatomic diagram of eye and adnexa. FIG. 230-2. 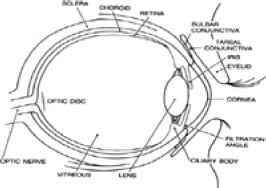 Horizontal cross-sectional diagram of eye.